Above is a photo of the new Museum of Art, Architecture and Technology (MAAT). Stay tuned for a travel report when I return. You’ve probably seen this video because it’s gone viral. The 22 year old Malian named Mamoudou Gassama was walking down a Paris street the other day when he saw a small child dangling from an apartment balcony. Without thinking, he scaled the building and rescued the child. A couple of days later he was received in President Macron’s office. Not to be deported back to Mali (he’s undocumented), but to be granted French citizenship and offered a job with the Paris Fire Department. He was also given an award and a certificate for bravery. Gassama arrived in France last year after making the dangerous boat crossing to Italy. But why was the 4 year old boy dangling from the balcony? Because the boy’s father had gone out to do some errands, leaving the child alone in the apartment. He was delayed because he stopped off in a café to play Pokeman Go. The mother wasn’t around. The father of the child was immediately taken into custody for failing to perform his parental obligation. See video here and The Guardian article further below. 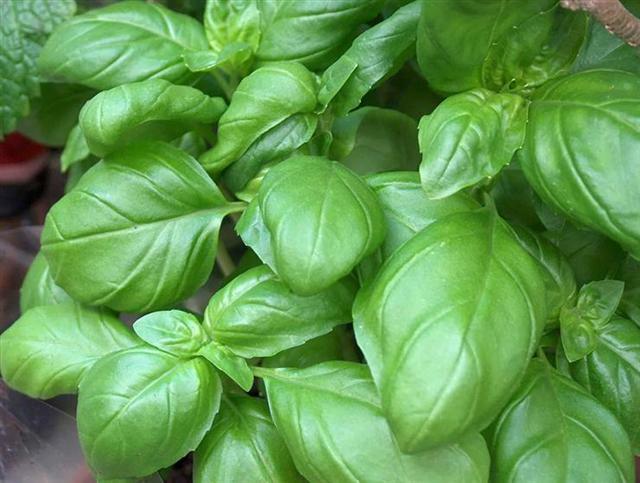 During the summer I buy large bunches of fragrant basil at my local market. And I make my own variation of pesto replacing pine nuts with walnuts and parmesan cheese with pecorino cheese. Once you’ve got all the ingredients assembled, it takes less than 5 minutes to make. These measurements are completely flexible. Add more or less to your liking. 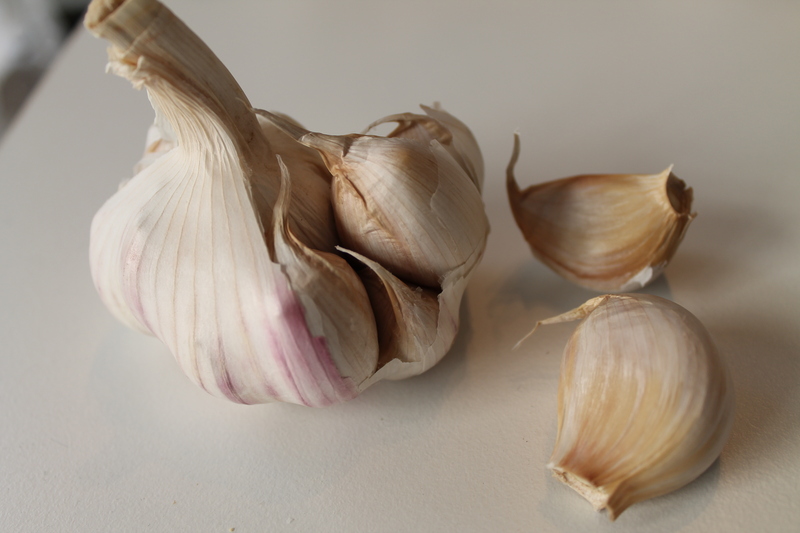 I can’t get enough of this pink garlic from Provence. I’m never without. 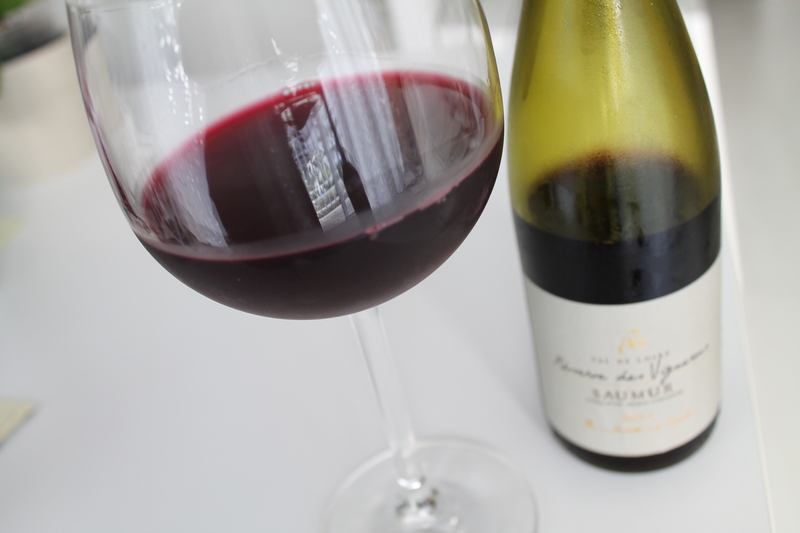 Whiz all the ingredients in a food processor, toss with cooked al dente pasta, and serve with a cooled, light red like this lovely Saumur from the Loire Valley. It’s that easy. Note: pesto isn’t just for pasta. Dollop it onto a tomato-mozzarella-onion salad or grilled chicken, bruschetta, pizza, scrambled eggs, etc. Quickly roast (or toast) 100 grams of pistachios in a dry frypan or under the grill. In a blender or food processor mix the pistachios with the leaves of one bouquet of fresh mint, the juice of one lemon, 10 cl olive oil, 50 g of grated parmesan, 3 garlic cloves and 3 tablespoons of water. If too thick, add a bit more water. Salt and pepper. Toss with al dente pasta and top with grated parmesan and lemon zest. I’d be inclined to serve this with a fragrant white wine, like a Gewurztraminer that I sampled a few weeks ago; a sweetish, floral varietal grown in the Alsace region of France. Alsatian wines are delightful; lately I’ve been giving them more attention. Strolling along the boulevard de Courcelles in Paris’s 8th arrondissement, you are suddenly arrested by an unexpected and spectacular sight. Stopping in your tracks you exclaim, “Oh, my God!” (which is appropriate seeing as it’s a church). Not a church, actually, but a cathedral. The Alexander Nevsky Cathedral is a Russian Orthodox cathedral located at 12 rue Daru (or the foot of rue Pierre Le Grand). Established in 1861, it was the first Russian Orthodox place of worship in France. To visit, the nearest metro station is Ternes. Guess who married here in July 1918? Pablo Picasso to Olga Khokhlova. The witnesses were Jean Cocteau, Max Jacob and Guillaume Apollinaire. When visitors to Paris ask me for out-of-the-way places to explore, I always suggest this area. Cities are composed of villages, really, or pocket neighborhoods and one of my favorites is the district bordering the small and beautiful Parc Monceau. One reason I like it so is because it’s completely off the tourist grid. The people you see are mainly residents or, during the week, people who work there. There are some great shops, restaurants and a market street. Yesterday I went to buy tea, flowers and macaroons. We’re enjoying perfect weather this weekend in Paris: 20 to 22 degrees with brilliant sunshine. Plus, it’s a 3-day weekend, Monday May 21st being the Christian holy day of Pentecost. (Yup, in this country, Catholics rule!) From the Russian cathedral, I walked up the road to Mariage Frères, the temple of tea located at 260 Faubourg Saint-Honoré (there are other locations dotted around the city.) I bought 100 grams of Marco Polo tea for 9 euros. There’s a restaurant-tea salon inside, but it’s too expensive for my pocketbook. Directly across the road is the outstanding La Maison du Chocolat (there are other locations around the city.) If you’re a chocolate lover, these are serious cocoa confections ranging from truffles, ganaches and pralines to éclairs, macaroons and other delights. In the warm months, they make their own sorbets and ice creams. Just up the road is the famous Salle Pleyel concert hall for classical music. I know this district well because I worked in it for two years. It was probably one of the worst jobs I have ever had. A small French law firm, the people were execrable. Not only was I harassed weekly by one of the senior partners, I was totally exploited and underpaid. Along with my regular tasks, I was expected to translate long legal documents, but received no status or recognition as a translator. The upside was the Parc Monceau located right beside the building. Small and romantic, it’s my most favorite park. If you come to Paris, you should definitely visit it. Abutting the park are two small museums, the Cernuschi (museum of Asian arts) and the Nissim de Camondo (an elegant Belle Epoque mansion housing a museum with 18th-century French furniture and decorative arts.) During those two years, when I wasn’t sitting on a park bench during my lunch hour, I was visiting these museums or striding vigorously up and down the nearby boulevards. Through the park (which was packed yesterday) and out the other side onto the boulevard Malesherbes to my favorite florist. And then back home to make tea, eat a macaroon (or two or three), recline on my chaise longue and admire my bouquet of fragrant freesia and iris. Insider shopping tip: if you have cash to splash and are into gorgeous Italian clothes, there’s a small boutique on the boulevard des Courcelles that sells clothes direct from Italy. Expensive, unique and gorgeous, it’s called Cairns Donna. I go there twice a year during the big sales in January and June. 55 bd Courcelles, metro Courcelles. Across the road is the same boutique for men. See, I don’t believe this (anymore). When bad stupid people run the world, fairness does not grow the greater, it shrivels. Notice that Tolkien wrote “perhaps”, because he wasn’t entirely sure. 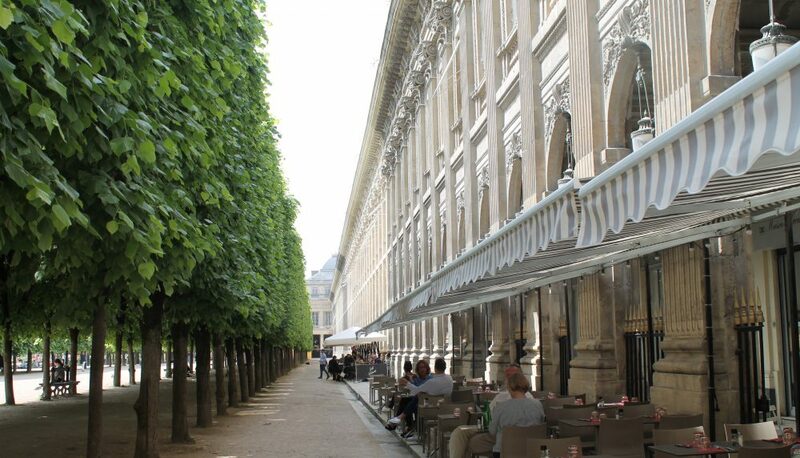 One of my favorite places to rendezvous is at the fountain in the Jardin du Palais Royal. I’ve been enjoying the graceful splendor of this garden for decades. There are restaurants and elegant shops under the arcades. Or you can just sit on a bench or chair and enjoy the sound of birdsong and the splashing fountain. The garden is a perfect starting point to do some shopping and have lunch. Today, Monique and I met at the fountain at noon. We then headed north towards the Galerie Vivienne, built in 1826. See this mosaic tiled floor? It’s the original floor created by Giandomenico Facchina, a 19th century Italian mosaic artist who did much of his work in France. We then headed towards the Place des Victoires where I wanted to visit the English boutique that I visit and rave over in London, The Designers Guild. This one had just opened. It was a lot smaller and, I’m sorry to say, the customer service didn’t hold a candle to the service you’d get in London. Directly across the road was this restaurant where we sat at an outdoor table. I ordered a tomato mozzarella salad and a tiny glass of wine, Monique ordered a sort of grilled chicken niçoise salad. When you think that you can buy a decent bottle of French wine for 6 euros and you’re charged 6 euros for a tiny glass, it’s a little bit scandalous. But this is the price you pay for the privilege of eating in a chic Parisian neighborhood. Upon entering, we spied a bunch of gorgeous scarves. Italian made, some were silk, some were a blend of silk and modal. A type of rayon, modal is a bio-based textile made from the beechwood tree. Modal fabric feels silky-soft on the skin yet is hard-wearing and colorfast when dyed. A woman can never have enough scarves, is my opinion. Again, we spent a long while talking to the friendly saleswoman and trying on scarves. I ended up taking these last two photos of myself in the mirror because no-one could figure out how to work my camera. ?? (Sigh. I always end up doing everything myself.) The scarf I ended up buying – half silk, half modal – is a gorgeous swirl of mauves, greens, pinks and yellows. It’s lightweight, soft and warm and you can scrunch it up (great for travelling.) It’s not cheap, it cost 190 euros. Our last stop was Dehillerin, the kitchenware store located off the rue du Louvre. I was in search of a strainer, called une passoire in French. This shop used to be, and still is, a wholesaler for restaurants. It was a sleepy dusty place. And then tourists discovered it, it became super-popular and now has a new lease on life. And now, to completely ruin this pleasant scene, a mere four hours later and blocks away from where we had spent such a peaceful afternoon, a knife-wielding terrorist killed one passer-by and wounded four others. And now, like a puerile, perverse, oversized and orange-haired Dennis the Menace, he has wrecked the Iran deal. Why? Because his intention is to unravel much, if not all, of Barack Obama’s legacy. Trump’s decision to pull the United States out of the Iran deal could place the lives of Americans – and people around the world – in danger. This deal illustrates the real world which is the strategic alignment between the American Neoconservatives and Israel’s Likud party, the same doctrine and the same politics which led us into the Iraq war in 2003. The United States, Saudi Arabia and Israel do not want Iran to return to the international game. They want Iran to fall. Trump is a selfish, brutal utilitarian who does not care about the external repercussions of his decisions. The bottom line is that the American President is being used by nefarious hard-liners, warmongers and ultra-conservative zealots inside and outside of the USA. He has succeeded in one thing: tarnishing the image of America worldwide. Now, when we see Americans abroad, we sort of feel sorry for them. This was not the case before. If opposition parties don’t get their acts together, Trump could well serve a second term. Here are two articles to read: in The Guardian, The Iran deal: how Trump’s actions could flare violence in the Middle East, and in Foreign Policy, Here’s What to Expect Now That Trump has Withdrawn from the Iran Nuclear Deal.